What are nonsteroidal antiinflammatory drugs? — Nonsteroidal antiinflammatory drugs, also called “NSAIDs,” are medicines that relieve pain and reduce inflammation. They are one of the most commonly used kinds of medicines. NSAIDs can help people who have conditions that cause ongoing pain, such as arthritis. They can also help people heal more quickly after an injury. But NSAIDs can cause problems of their own, so it’s important to take the lowest dose you need for the shortest time. You can buy many NSAIDs without a prescription, including aspirin, ibuprofen (sample brand names: Advil, Motrin), and naproxen (brand name: Aleve). These same NSAIDs can also be prescribed by a doctor, usually at a higher strength. Plus, there are many other prescription-strength NSAIDs. Are all NSAIDs the same? — Yes and no. All NSAIDs work on the same chemical process in the body, but they do it in different ways. Some NSAIDs need to be taken more often during the day than others to work for certain kinds of pain. And some are more likely than others to cause certain side effects. Are NSAIDs safe for everyone? — No. People with certain medical conditions should avoid NSAIDs or use them with care. Talk with your doctor if you buy NSAIDs without a prescription (called “over-the-counter”) to be sure they are safe for you. ●If you have an ulcer in your stomach or intestine or you have ever had bleeding in the gut, ask your doctor if NSAIDs are safe for you. Your doctor might suggest that you take an NSAID along with a medicine that can protect your stomach and intestines. That’s because NSAIDs can damage your stomach or intestines. ●If you have heart disease or ever had a stroke, ask your doctor if it is safe to take an NSAID. NSAIDs can increase the risk of heart attack, heart failure, and stroke. This is especially true for people who already have heart disease or risk factors like high blood pressure. But if your doctor prescribes low-dose aspirin to prevent heart attacks or stroke, you should take it as directed. At low doses, aspirin can actually protect you from these problems. ●If you have kidney disease, heart failure, cirrhosis, or you take medicines called diuretics (also called “water pills”), avoid NSAIDs completely. 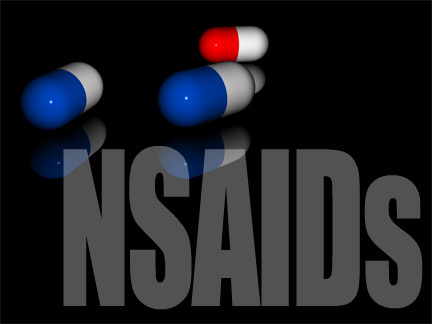 NSAIDs can make heart failure, kidney disease, and cirrhosis worse. NSAIDs can also cause kidney problems in people taking diuretics or certain other medicines to control blood pressure. This can happen in people with very mild kidney disease or in older people. ●If you have high blood pressure, ask your doctor if NSAIDs are safe for you. NSAIDs can raise blood pressure even in people who are taking medicine for high blood pressure. Experts recommend that people with high blood pressure who need NSAIDs take the lowest possible dose for the shortest amount of time. ●If you have any disorders that increase the risk of bleeding, ask your doctor if NSAIDs are safe for you. ●If you are having surgery, ask your doctor if you should stop taking NSAIDs. Most people need to stop NSAIDs, including aspirin, a week before surgery to lower the risk of bleeding. ●If you are pregnant, avoid NSAIDs during the last 3 months of pregnancy. They are probably safe to use when breastfeeding, but check with your doctor or nurse if you are breastfeeding. ●Stomach upset, ulcers, and bleeding – NSAIDs can cause stomach upset. If you take them regularly for a long time, NSAIDs can also cause ulcers or bleeding in the stomach or intestines. ●Liver damage – Long-term use of NSAIDs, especially at high doses, can harm the liver. ●Kidney damage – Using NSAIDs, even for a short time, can harm the kidneys. They are especially risky in people who already have kidney disease. ●Ringing in the ears – Ringing in the ears (tinnitus) is common in people who take high doses of aspirin. It can also happen in people who take other NSAIDs. The ringing usually goes away when they take a lower dose. What happens if I take more than the recommended dose? — Taking more than the recommended dose of an NSAID might cause serious problems. Also, it could make side effects much more likely without helping your symptoms very much. On the other hand, taking too much aspirin or acetaminophen (sample brand name: Tylenol) can be harmful or even cause death.